The 2nd Major Championship of the year is just around the corner, so we thought we’d take a look at the host course, the players in this year’s field, and US Opens gone by to see who we thnk might fare well in Pennsylvania this week…. First staged in 1895, the US Open is one of golf’s four marquee events, with its uniqueness lying in the undeniable difficulty of the USGA regulated layouts on which it’s hosted. 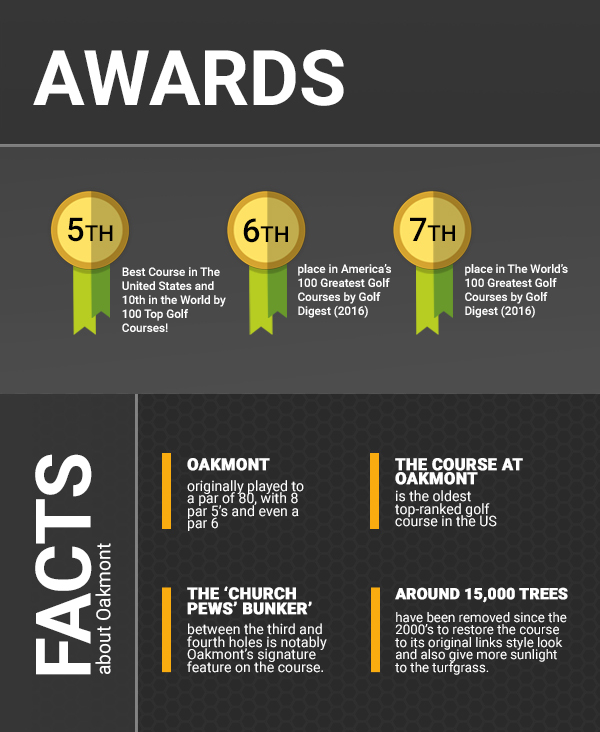 Speaking of layouts, the US Open has been played on some of America’s most iconic courses. Pebble Beach, Oakmont (this year’s host), Congressional, Winged Foot, Merion, Bethpage Black, Pinehurst, Torrey Pines, Shinnecock Hills…the list goes on and on. Speaking of lists, the one of past champions is impressive too, with celebrated and legendary names including the likes of Bobby Jones, Gene Sarazen, Ben Hogan, Arnold Palmer, Jack Nicklaus, Gary Player, Lee Trevino, Tom Watson, Ernie Els, Tiger Woods and more recently Rory McIlroy and Jordan Spieth all having laid their hands on the famous US Open Trophy. Originally a one day 36 hole tournament, the US Open has grown into a 72 hole beast of a tournament, bereft of birdies, where the winner is often the very last man standing; he who can cope with almost unlike sportsman like abuse coming from the golf course itself. Historically, winners have understandably hailed from the USA, but in recent years, the list of champions has been enhanced by a new international flavour, with only 3 Americans winning the title between 2004 & 2014. If one thing is certain at the US Open, it’s the calibre of champion the tournament produces. Invariably, you don’t see surprise winners at this tournament. So look out for a marquee name topping the leaderboard come Sunday evening. Created over 100 years ago from a non-descript patch or farmland, Oakmont has since hosted more major championships than any other course apart from Augusta National – annual host of The Masters – and is widely considered to be one of, if not the toughest golf course in the world. Perfect then for the US Open. For this year’s US Open, Oakmont will stretch to a total length of around 7,254 yards. Not the longest from a modern standpoint, but throw in the brutal US Open rough we see courtesy of the lovely chaps at the USGA each and every year, that’s more than long enough to test the world’s best. Designed and built by Henry C. Fownes and his son, both of whom believed a poor shot should always be penalized, this year’s tournament will see Oakmont become a nine-time host a the US Open, and as well as being notoriously difficult, it also has a habit of producing winners of the highest calibre. ¾ of previous US Open champs to have claimed victory at Oakmont happen to be in the World Golf Hall of Fame. Oakmont has also hosted its fair share of PGA Championships; and two of the guys to have won the Wannamaker Trophy here also take up a spot in the Hall. Oh…there are also Hall of Famers who have won the US Women’s Open and US Amateur at Oakmont too. So what do we expect from Oakmont this year? Punishing rough. Plenty of bunkers. Like lots and lots and lots of them. Oh…and impossibly quick greens coupled with some borderline naughty pins set out by the USGA. That’s what Phil Mickelson had to say about Oakmont in the build up to this year’s tournament. 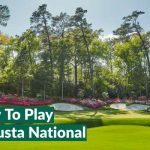 Considering the last time this storied course hosted America’s national championship, Angel Cabrera won with a total score of 5 over par, don’t expect a birdie fest in 2016. Expect the man with the most patience, and perhaps even with the most luck on his side, to be the last one standing come Sunday evening. It might be hard, but the likes of Johnny Miller have proven in the past that Oakmont isn’t actually impossible! 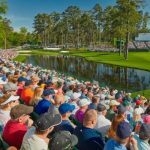 Unlike The Masters, the PGA Championships and pretty much every other top level professional golf tournament, anyone with a 1.4 handicap or better can enter the US Open. Having that said that; don’t expect many handicap golfers to actually have their names on the start sheet when the gun goes on Thursday morning. Don’t be surprised to see a few names out on the course though that you may never hear from again. With the potential unknowns covered, the best of the rest obviously include the world’s finest golfers. The modern ‘Big Three’ will all be in the house including of course last year’s winner, Jordan Spieth. Both he and Rory McIlroy have had fairly non-descript seasons so far, with Jordan’s putter retreating from red, red, RED-hot to luke warm for a little while. By his standards anyway that is. And until recently Rory seemed to have one bad-to-average round in four halting his progress to further tour wins. Can Jordan Spieth go back to back at The US Open? 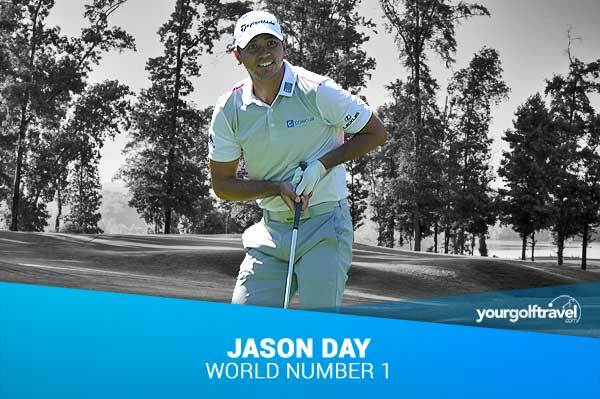 Both players will no doubt fancy their chances with recent wins in mind but at the same time, both will probably have to be right on their games to stop Jason Day from claiming his 2nd major title. Day’s form over the last year or so is comfortably the closest we’ve seen to Tiger Woods’ dominance of yesteryear, with no less than 8 wins over the last couple of seasons combined. Including the three superstars mentioned above, 59 of the world’s top 60 players are expected to tee it up at Oakmont, and they’ll be joined by eleven amateurs who have made the grade. Historically though, the US Open, while frustrating to watch at times to due to the brutal nature of the test that the players face, does in fairness produce thoroughbred champions. Don’t be surprised to see another top tier player get his hands on the trophy in 2016. After all…four of the last five winners of the US Open have been in the Top 15 of the World Golf Rankings at the time of victory. – The best EVER winning score at a US Open hosted by Oakmont is 5 under par. Last time out Angel Cabrera won on 5 over par. – Jordan Spieth, last year’s champion at the age of 21, became the youngest US Open winner since Bobby Jones way back in 1923. 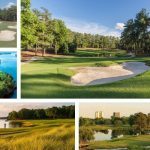 – Hale Irwin is the oldest US Open Champ. He bagged his 3rd win at the age of 45. – Rory McIlroy won his 1st major championship at the age of 22 and in doing so posted a tournament record score of 268 (-16) through 72 holes. – In 2000, Tiger Woods put in arguably the greatest performance ever seen in golf when he won the US Open by an astonishing 15 shots at Pebble Beach. 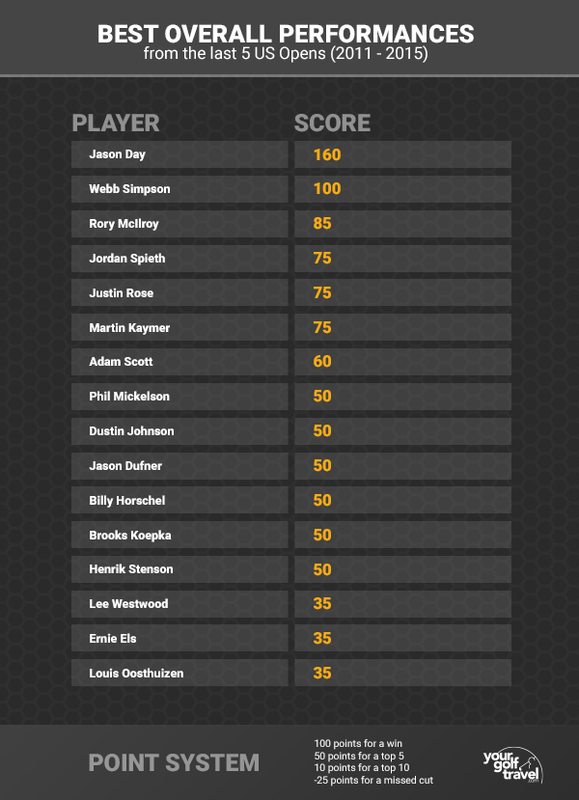 Webb Simpson might be a surprise US Open specialist, but world number 1 Jason Day is a name we expect to see topping a US Open form leaderboard! The US Open is a war of attrition. He who ignores how frustrating a US Open course can be better than others should automatically save himself a few shots over the field. For that reason, I’m passing on Rory McIlroy this time out. In my mind Rory has the best overall game in the world when he’s on. But when things start to go wrong for Rors, his shoulders can slump and his head can drop. Throw a reportedly impossible Oakmont layout into the fray and until the Irish Open, one less than satisfactory round in four, and I think McIlroy will come just short again for major number five. Jason Day’s game overall game has been the best in the world for a while now (I still think when Rory gets it going he trumps the Aussie though) but his driving accuracy ranking of 163rd on tour doesn’t bode well at Oakmont. Neither does Dustin Johnson’s who weighs in only a smidge above Day in the driving accuracy steaks at 162nd, but DJ has a great US Open record, and last year’s runner up, whose mentality for the pressure cooker of a major championship weekend has been perhaps rightly questioned, surely must be talented enough to drag himself over the line at one stage or another. 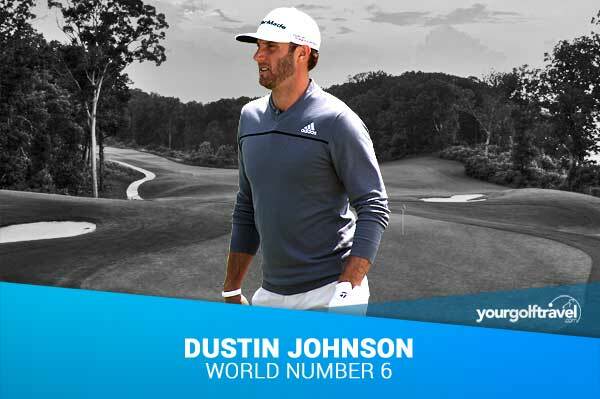 In short…if the big man can play from tee to green as he usually does, even if he misses his fair share of fairways, as long as he can forget Saturday and Sunday are two very real days of the week, he’ll surely be in with a shout at yet another major. I’m going for something a bit different with my pick for the US Open. Winners are proving quite difficult to pick this year so far, but you can pick up decent odds for Bryson DeChambeau to finish in the top 5 this week. I really think he is one to watch generally and the more I read about and see him in action, the more I like him as a player. Whether it’s his much discussed single length irons or the fact that he checks the balance of every ball he plays with by floating it in salt-water (deeming one in three straight out of the box not fit for his needs apparently! ), he is certainly carving out his own unique style. He forfeited his exemption to this year’s event when he turned pro, and has been through qualifying to earn his spot anyway. He finished in the top 5 in the RBC heritage back in April in one of his first professional starts, but it will of course be a big step up for him to do it in a major. Having said that; he did equip himself rather well over the first few days at Augusta. He has been drawn to play with Jordan Spieth and Zach Johnson for the first two days, who will hopefully provide plenty of inspiration for him to play well and get himself in contention. Looking back to 2007 when The US Open was last held at Oakmont there are some pretty relevant names to today’s game that spring out it also blurs the canvas a little more as well as it doesn’t suggest that there is a specific type of game suited to taming the course. Take long driving Bubba Watson, now a 2-time Masters Champion, you wouldn’t necessarily say his game was suited to the fast greens and penal rough of Oakmont and yet Watson managed a tie for 5th, finishing just 4 shots shy of Cabrera. Then you have the likes of Justin Rose and Paul Casey who considered more all-round players with an ability to hit fairways and greens who finished in a tie for 10th. Jim Furyk another golfer famed for his consistency and ability around the greens finished just a shot shy in a tie for 2nd. So, where does this leave us with a pick for Oakmont? Well it means that the likes of Spieth, Scott and Day are all likely to contend. Their ability to compete off the tee with decent rankings in driving distance matched with decent putting stats means they’ll stand a good chance of gaining strokes around the dancefloor. When fairways are missed and approaches evade the green (rare in comparison with the tour average) these players can still save par which gain positions against the field. With most people backing the likes of Mcilroy, Day & Spieth, I have decided to go for an underdog at Oakmont this year! Not just any underdog, this fella comes from my local area of Barnet in North London so I’ll be rooting for him from the off. Since being a rising star in the Middlesex County Union, AJ has gone from strength to strength and recently made his pro breakthrough with a win at the Spanish Open. Valderrama is a notoriously difficult course so he can obviously get it done with the odds stacked against him. He may not be a favourite for the 2016 US Open at 250/1, but you never know…if Leicester can win The Premier League, Andrew Johnson can win the US Open! I’m going patriotic for this one. 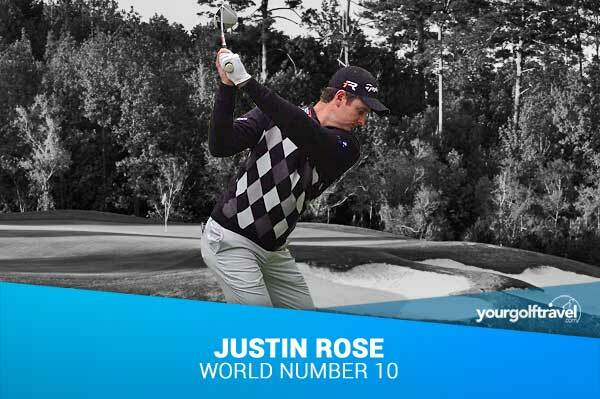 Justin Rose for me. The course this week is very hard with an over par score winning last time it was held at Oakmont. Justin is in good form and won at Merion which is a similar course and equally tough so he clearly knows how to win ‘ugly’ on demanding courses. He has the game, the patience, the previous and the pedigree. Usually a tournament dominated by US players, the course calls for accuracy and not always length (apart from the ridiculous 288 yard Par 3, #8 hole of course), so I am going for an international winner. With pin point play from tee to green, it’s time from Branden Grace to step up to the plate and earn a major title. 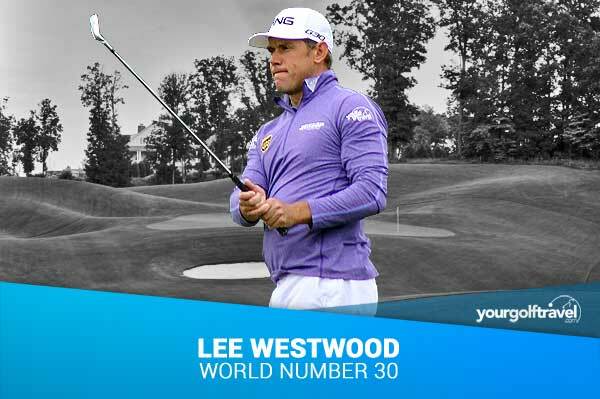 Lee comes into this event in great form with 4 top 15 finishes in his last four events. 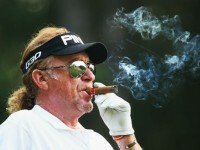 He is a big event player too with 20 career top 15s in major championships. A course like Oakmont will test even the world’s best players to their limits…mental strength and patience will be key. Lee’s long game is among the very best so hopefully he’ll be avoiding Oakmont’s treacherous rough more than most which should stand him in good stead. A lot of money will be put on the big three of Day, Mcilroy and Spieth but at a longest of 9/1 there is no value in backing them in such a big field. At longer odds Charl Schwartzel (66/1) and Jason Dufner (100/1) offer some great value but with Lee’s pedigree, I’m hoping he’ll finally land his maiden major and boost my bank balance!